A top commander warned that Iran is ready for an all-out war with US, alleging that aggression against Tehran “will mobilize the Muslim world" against it. The remarks follow Secretary of State John Kerry’s claims that military force was still an option. Kerry has recently appeared to try to ease tensions with the Jewish state by assuring it that war was still on the table. This and possible other similar remarks don’t sit well with Salami. "We have prepared ourselves for the most dangerous scenarios and this is no big deal and is simple to digest for us; we welcome war with the US as we do believe that it will be the scene for our success to display the real potentials of our power," Salami said, as cited by Iran’s FARS news agency. The general’s rationale is that past US military victories owe themselves to their enemies’ “rotten” armies – not the case with Iran, he warned. Addressing the officials currently at the negotiating table, Salami urged them to halt negotiations if any threat of force is issued again by a US official. 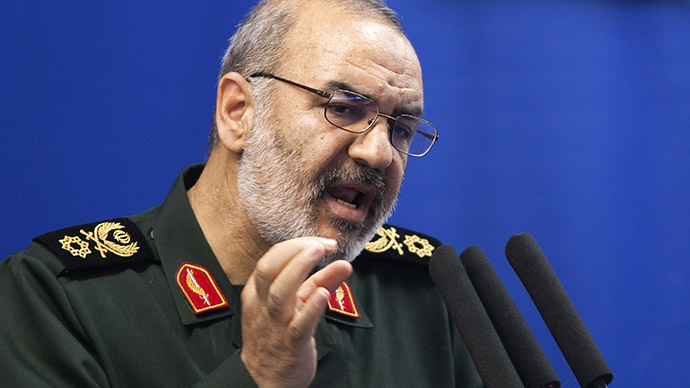 Salami echoed the words of Supreme Leader Ayatollah Seyed Ali Khamenei, who in a separate speech remarked that making simultaneous military threats while at the negotiating table will not fly. "This is not acceptable that the opposite side continues making threats simultaneous with the talks," he said at a public meeting with teachers in Tehran on Wednesday. The Supreme Leader also referenced remarks from two US officials whom he did not name, but whom also said action wasn’t completely off the table, saying that: "Negotiation under the ghost of a threat is meaningless and the Iranian nation does not tolerate negotiation under the shadow of threat." "Secondly, as I had already stated during the term of the former US president, the era of hit-and-run attacks is gone and the Iranian nation will not let go of anyone” with aggressive plans on it. According to the religious leader, this is for the simple reason that the US needs the negotiations as much as Iran does, as it wishes to be seen as the country that put Iran in its place at the negotiating table. But he added that while it would be best that the crippling economic sanctions by Western powers were lifted, it is “our own planning, will and ability, no matter the sanctions are in place or not," that is crucial here. Kerry is not alone in appearing to keep the threat of force alive. Last month Republican Senator Tom Cotton (Arkansas) claimed that it would take Washington just several days to destroy Iran’s nuclear facilities. Cotton was the author of the letter signed by 47 Republican senators and sent to the Iranian leaders, saying that a nuclear agreement made without congressional approval might not last beyond the Obama administration. On Thursday, the US Senate passed a bipartisan bill that would give Congress review rights over the White House’s Iran nuclear deal. A faction led by Tom Cotton and Marco Rubio (R-FL) attempted to insert a number of amendments into the bill during the floor debate, including a provision requiring Iran to recognize Israel as a Jewish state. It echoes the demand of PM Benjamin Netanyahu who wants any final deal with Iran to include a "clear and unambiguous Iranian recognition of Israel's right to exist." Meanwhile, on Monday the Iranian foreign minister addressed Israel on behalf of the 120-nation Non-Aligned Movement, calling that it gives up the bomb, as well as renewing calls for a nuclear-free Middle East.